Üma Kleppinger is a recognized authority as a teacher of therapeutic movement, with a special emphasis on recovery, injury prevention and rehabilitation for cyclists. She has been teaching yoga for cyclists for over 10 years. 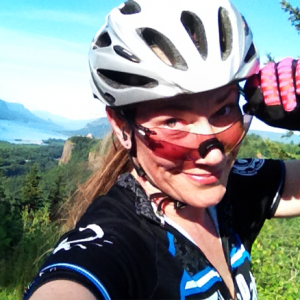 Her lifelong relationship with cycling has taken Üma from working as a bike messenger in New York City during college, to cycle touring, to competitive road, cyclocross, and mountain bike racing. Even sports we love take a toll on our bodies and Üma understands the repetitive stresses of training, competing or just riding around town a lot. Her goal is to help others create optimal health physically and mentally for peak performance—in their physical health and performance and in life. With over 15 years’ professional experience, Üma has taught advanced studies in therapeutic yoga techniques for teachers, movement therapists and bodyworkers, and has directed yoga teacher trainings. Renowned for her keen analytical perception of even minor musculoskeletal imbalances, Üma is passionate about helping clients find freedom from pain. Her studies in Eastern philosophy and Western psychology complement her approach to sports psychology and coaching. Üma is a freelance copywriter and creative director specializing in bike and outdoor industries. She is the author of BikeYoga: A Simple Program to Tune-Up Your Mind and Body. She lives in Portland, Oregon and is currently authoring her third book, a personal memoir of how riding a bike could save your life. When not busy writing Üma can be found riding the loamy trails of her beloved Pacific Northwest, or defying gravity on her dirt jump bike at the local Bike Park.